Led by priests from the Orthodox Church, thousands of anti-gay protesters forced the cancellation of a gay pride rally today in Georgia's capital of Tbilisi. Police in Tbilisi guarded several dozen gay activists and bused them out of the city center shortly after they arrived at the gathering. Those occupying the street held posters reading "We don't need Sodom and Gomorrah!" and "Democracy does not equal immorality!" A number of protesters carrying bunches of nettles threatened to use them on gay activists. 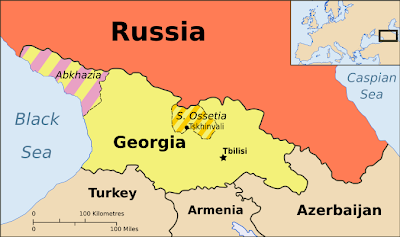 They insist that homosexuality runs against Georgia's traditional Orthodox Christian values. Father David, a priest who was one of the organizers of Friday's anti-gay rally, said the parade "insults people's traditions and national sentiments." A gay rally in Tbilisi last year was also short-lived and ended in a scuffle. VIDEO: Priests and young men chased rally participants to buses. Seventeen people were reportedly injured.